I have been on and off the track since I was a kid. I always ran distance events, however I stopped running after grade 6. Once in high school, I trained in grade 9 but did not compete. I got more serious with mountain biking from grades 9-11, however in grade 11 my gym teacher suggested running track. During my grade 11 year I began to love running and so I ran on my own during the summer to keep my fitness so I could run cross country. During my first regional meet for cross country I won the race and was approached by my current club coach Peter who suggested I train with his team. Once I started running with ASEA, I would say that is when track really began for me. After graduating high school in 2016, you enrolled at St. Thomas University and run for the Tommies Track and Field and Cross Country teams ever since. In regards to both education and athletics, what made you choose St. Thomas? Education wise, St. Thomas was a perfect fit: it specialised in my major, criminology and criminal justice, and was a smaller school with smaller classes, which appealed to me. There are more situations where you can have class discussions and voice your opinion. Athletically, St. Thomas had a great coaching staff run by Alex Coffin, and I felt I could succeed both academically and athletically. 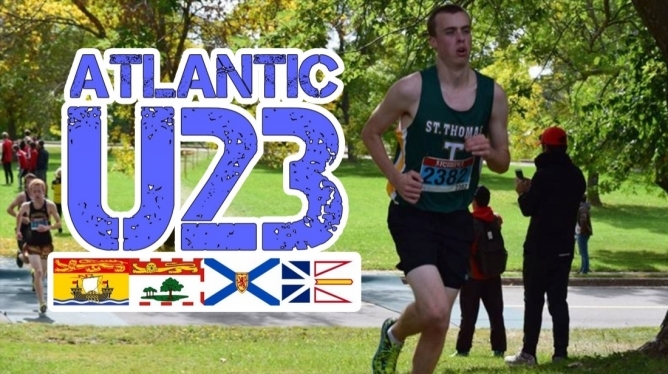 In 2017 you focused on the 3000m steeplechase in hopes of qualifying for Team New Brunswick for the Canada Games. Take us through your experience of trying out the steeplechase and attempting to qualify in this event. During the 2016 season, my coach and I discussed trying out for Canada Games the next year. We decided that the 3000m steeplechase would carry my strongest chance of making the team, seeing as there are not as many athletes that compete in it, and New Brunswick already had strong 1500m and 5000m runners. I soon fell in love with steeplechase, and it is my favorite track event as it offers a more interactive race. During the year trying to qualify, I gained some valuable knowledge, both from steeplechase and from the whole process of trying out. I competed in smaller meets in Moncton heading into the trials. During the trials, I started off in third among New Brunswick athletes, and was about 10-15 meters behind Bryan Thomas and the other runners until the last lap when I caught up to Bryan and took second place up until the last few meters, but getting edged out at the finish line by 0.17 of a second. Although I didn't make the team, I was very happy with my personal best and I knew I gave it my all leading up to the trials. Comparing your personal bests on the IAAF Scoring Tables of Athletics, your 10:27.61 personal best in the 3000m steeplechase marks your strongest performance. Do you intend to make the steeplechase your primary event, or stick to the flat distance races? The steeplechase has become my favorite track event, and so I do intend on continuing with the event, and hope to be hurdling the barriers in future seasons and focusing on perfecting my technique for the event. Following the 2017 outdoor season, you have only raced a couple of times. What explains the time away from competition? I had weird injuries that I had to clear up, so I've been focusing more on getting healthy. I had low iron during the cross country season and got tendonitis in my hamstring two weeks into the indoor track season, which put me out for the remainder of the school year. During the summer I only raced twice because I wanted to focus on getting my fitness up, and I wanted to train through the summer and straight into the cross country season. What are your plans for the upcoming cross country and indoor seasons? For cross country I plan on staying healthy, while also trying to increase mileage and get back into racing form, and for track I would like to drop my times and hopefully break nine minutes in the 3000m. You run both cross country and the distance events on the track, along with a bit on the road running side, but which side of the sport do you enjoy most? I enjoy running cross country and road running equally; I find that sometimes longer races on the track are harder to stay focused and are less interesting than the changing scenery that cross country and road running offer. For track events I prefer running the 1500m and 3000m steeplechase as they are a bit shorter than the long distance events. All cross country races within USports offer a distance of 8km for men, except for the regional and national championships which host a 10 km distance. What are your thoughts on the distances offered by USPORTS, and the increased distance used solely for championship races? I like running both 8km and 10km, however I would prefer if USPORTS would run 10km for the full season and not only have regional races and national championships with the longer distance. I think it would help to have the longer distance all season, especially for first year runners so they can adjust to the longer distance prior to running the final qualifying meets. Compared to sprinters and field event athletes, distance runners often compete all year round, racing the outdoor, indoor, road, and cross country seasons. How do you stay fresh and injury free whilst competing year-round? I take approximately 2-3 weeks off running between each season, and bike in between. I like listening to music, watching movies, biking, and cooking.